Humphrey Bogart is employed to investigate blackmail in a rich family, but gets drawn into a complex of dealings and murder, plus the allure of Lauren Bacall. Humphrey Bogart is excellent as private eye Philip Marlow in this complex thriller. 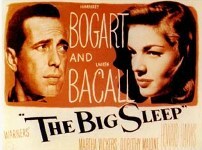 The plot from the Raymond Chandler novel is helped by the on screen chemistry between Humphrey Bogart and Lauren Bacall.